It’s officially holiday season. That’s right: Grey Thursday, Black Friday, Small Business Saturday, and Cyber Monday are just around the corner, so be sure to get your tent set up in line, put your fighting gloves on for five a.m. door buster sales, and fill your wallet up with green. Not the holidays you thought I was referring to? In recent years, commercial shopping-related events have occupied a sort of unofficial slot on the calendar after Thanksgiving. How exactly did retail holidays become as synonymous with Thanksgiving as pumpkin pie and bloated bellies? Starting in the late nineteenth century, when store sponsored Thanksgiving parades were all the rage, most retailers adhered to an unofficial agreement that they would not start to aggressively market holiday shopping until the day after Thanksgiving. But in 1939, when Thanksgiving was set to fall on November 30, the Retail Dry Goods Association wrote to Franklin Roosevelt, warning him that the late falling of Thanksgiving would cut too severely into the season of plenty for retailers. Roosevelt made a simple concession: he moved Thanksgiving from the last Thursday in November to the fourth Thursday in November, where it remains to this day. 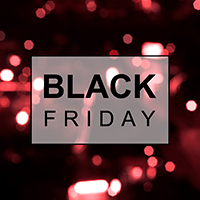 By the early 1980s, Black Friday had become a national event. Retailers and media sources alike simply reinvented the term’s origin story, claiming that it was coined in reference to an accounting idiom: being “in the red” vs. “in the black.” This idiom refers to retailers’ old habit of recording their losses in red and their gains in black, and so Black Friday was positioned as the coveted day when retailers would finally go from being in the red to being in the black. If there are two things marketing agencies understand about language, it’s that 1) having a name for something gives it a sense of validity, and 2) language has the power to create self-fulfilling prophecies. That’s exactly how the term “Cyber Monday” was born. In 2005, the National Retail Federation’s e-commerce division was trying to come up with ways to boost online shopping during the holiday season. They wanted to capitalize off of Black Friday’s success by creating a tandem holiday, so they sat down and started brainstorming names. They considered Black Monday, but that seemed too obvious, Blue Monday sounded too somber, and Green Monday sounded too environmentalist. They decided to ditch the colors and get straight to the point – Cyber Monday was to be marketed, after all, as a day for online shopping. Once they had their name, they needed a narrative like Black Friday’s. On November 21st, just three days before Thanksgiving, Shop.org put out a press release entitled ‘Cyber Monday Quickly Becoming One of the Biggest Online Shopping Days of the Year.’ The release even offered an explanation – it said that consumers waited until the Monday after Thanksgiving to do their online shopping because their Internet connections at work tended to be faster or more secure than at home. In reality, the Monday after Thanksgiving was slotted as the twelfth biggest online shopping day at the time. But in the following years, between 2006 and 2017, annual Cyber Monday revenues grew from six-hundred million to 3.3 billion dollars, an increase of more than five-hundred percent. In the wake of the ultra-successful marketing campaigns of Black Friday and Cyber Monday, other sectors have been jumping on the band wagon, trying to turn Thanksgiving weekend into a full-blown retailers’ paradise, with a slice of the pie for everybody. In 2010, American Express created “Small Business Saturday” to encourage consumers not to forget to stop by their local toy stores and clothing shops. And then for the first time, in 2012, Walmart, along with Toys “R” Us and Kmart, opened up at 8 p.m. on Thanksgiving day. Black Friday’s slip into “Grey Thursday” took retail workers along with it, leading to major staff backlash that ultimately resulted in nationwide Black Friday strikes. As for me, I’m still waiting to see what they come up with to fill the last hold-out of Thanksgiving weekend. Startup Sunday? Sunday Fun-day? Or maybe big retailers can take a cue from Patagonia’s 2016 Black Friday campaign, in which they decided to donate one hundred percent of sales to grassroots environmental groups. Charitable Sunday, anyone? After all, it is the season of giving. Janet Barrow writes about the places where language meets history, culture, and politics. She studied Written Arts at Bard College, and has fiction work forthcoming in Easy Street. Recently, she completed a diploma in medical interpreting. Raised in Minnesota, she currently lives in Lima, Peru. To learn more about ALTA’s language services, including translation, training, interpretation, and testing, visit: www.altalang.com.